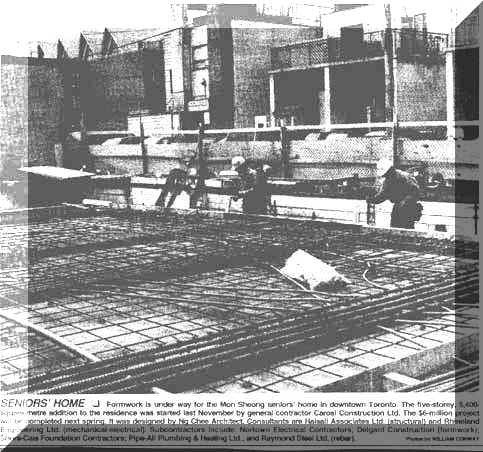 SENIORS' HOME - Formwork is under way for the Mon Sheong seniors' home in downtown Toronto. The Five-storey, 5,400 square-meter addition to the residence was started last November by general contractor Carosi Construction Ltd. The $6-million project will be completed next spring. It was designed by Ng Chee Architect. Consultants are Halsall Associates Ltd. (structural) and Rhineland Engineering Ltd. (mechanical-electrical). Subcontractors include: Nortown Electric Contractors; Delgant Construction (formwork); Shore-cais Foundation Contractors; Pipe-all Plumbing & Heating Ltd.; and Raymond Steel Ltd. (rebar).